Time plays a big role in how you collaborate on GitHub—time of day, time of the week, and time of year. 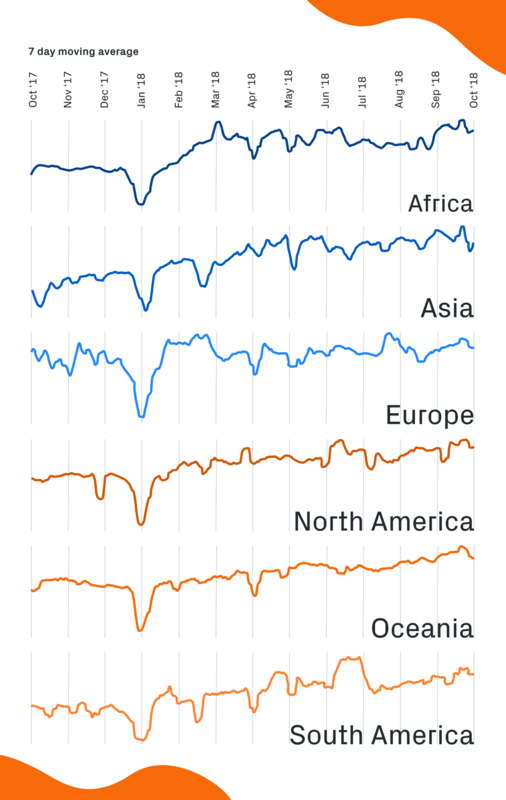 In our Octoverse report, we shared an overview of GitHub activity trends across the world. While everyone’s schedule is different, it turns out we all have something in common no matter where we are: making time for the people and projects that matter most. The time you spend on and away from GitHub tells us something equally important. You’re putting in the hours for your favorite open source projects, but you’re also giving yourself breaks to recharge and celebrate the holidays. To show this seasonality of GitHub activity, we analyzed contribution density in open source, public, and private repositories aggregated at hourly, weekly, and annual levels. When it comes to daily routines, activity in private, public, and open source repositories all follow a similar pattern during daytime hours. We’ve found that work increases hour by hour in the morning, with activity hitting an initial peak at around 11:00 local time. 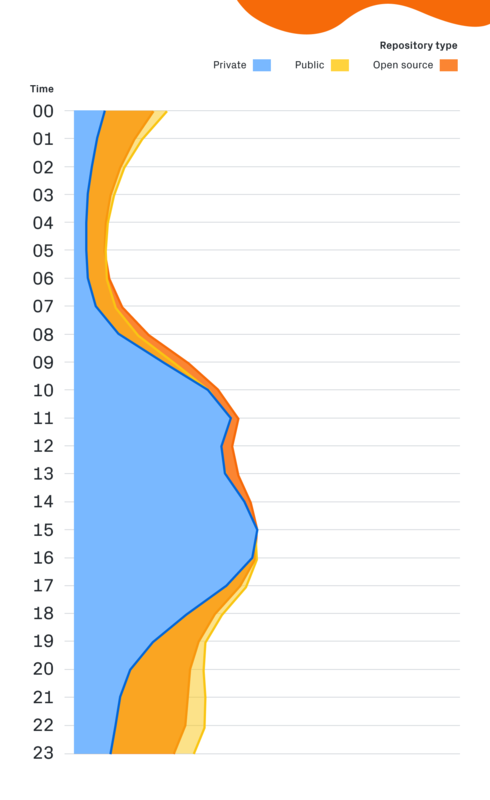 This is followed by a noticeable dip of several hours before the day’s second activity spike at 15:00. So what’s happening in between? Say “thank you” to the circadian rhythm–no matter what type of project you’re working on, chances are you’re stopping to grab a bite to eat. We can see that contributors in Mexico and Argentina take lunch later in the day compared to contributors in the U.S. And in China, a midday break is serious business, with the lunchtime change across all repositories even more pronounced. After lunch, work picks back up until activity in private repositories begins to wind down for the night. Then something else happens: contribution to public and open source repositories increases. In places like Japan and Singapore, you keep contributing to open source projects until it’s time to go to sleep–and the day starts all over again. At the end of the work week, you relax, recharge, and maybe spend some time on personal projects. Saturday and Sunday are the quietest days of the week on GitHub across all continents—but while lower than weekdays, contributions stay steady for both public and open sources repos. In comparison, contributions to private repositories hit an all-time high during mid-week. And we see this same trend across all repositories, not just private. The greatest percentage of contributions happen on GitHub between Tuesday and Thursday. With several major holidays around the world coming soon, we’re now approaching the biggest indicator of activity on GitHub: seasonality. No matter where you’re located, you’re giving yourself several breaks throughout the year–whether to celebrate with family or take that much-needed vacation. We see changes across every region during different holiday seasons and (sometimes correlatingly) when students are out of school. January 1: As the first day of the year for countries that use the Gregorian calendar, New Year’s Day is the quietest day on GitHub annually. January and February: Activity slows down in Asia (and China in particular) between January and February, depending on when Chinese New Year falls. May 1: We see a change in overall activity the first week of May when around 80 countries celebrate Labor Day. October and November: Projects scale back in India, China, and other parts of Asia during Golden Week and Diwali. We also see a drop in activity in the U.S. during Thanksgiving. As exciting it is to see how you collaborated on GitHub over the last year, we’re also happy to find you’re taking time away. 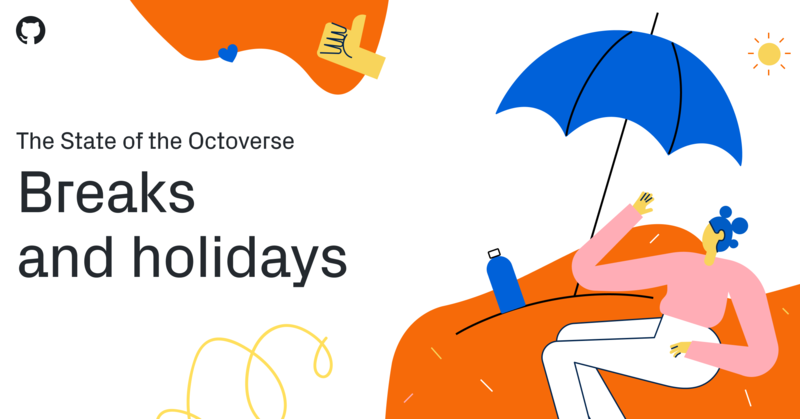 Through all the different ways that we work and celebrate around the world, one thing is for sure: everyone deserves a break. Stay tuned for more posts that dive into data on the GitHub Blog—or check out our reports on projects and programming languages to see what a community of 31 million developers can accomplish in a year. Next articleraywenderlich.com Black Friday Sale: Yearly Subscription for Just $99! 5 best screenshot apps for Android and other screenshot methods too!